I\'m a Smooth Jazz Guitarist. My first debut CD was out in 2003 and it went Chartbound on the Smoothjazz.com for 10 weeks. I\'ve been a side man for years and now it\'s time for me to step out once again. You\'ve heard me on the Number 1 single Billboard & Smoothjazz.com and Grammy winning song \"Morning\" with George Benson & Al Jarreau \"Givin\' It Up\" CD and also on the single \"Ordinary People\". I\'m on Marion Meadows CD \"Dressed To Chill\" (6 on Smoothjazz.com & 4 on Billboard), I play on 8 songs \"Dress To Chill\" guitar rhythm & solo, \"Remember Me\"-rhythm guitar, \"Dance With My Daughter\", \"Miss Know It All\", \"Bounce\", \"Just My Style\", \"1000 Dreams\", \"To Love Her\". I\'m playing Flugelhorn and guitar on \"Coco Flow\" too! I\'m also on Marion Meadow\'s \"Players Club\"- rhythm & solo on that tune, \"Sweet Grapes\", \"Suede\", \"Diggable\"-rhythm & solo, \"Step A Little Closer\" -rhythm & solo, \"Deska\"-rhythm guitar, \"After 6\". I\'ve now finished my second CD called \"Feelin\' It\". I have Nelson Rangell on sax, Najee on sax, Walter Beasley on sax, Michael Lington on sax, Luis Conte on percussion, and my wife Evelyn \"Champagne\" King on lead vocals on \"Happy Feelings\"!, Alex Al on bass, Mel Brown on bass, Michael White on drums, Michael Broening ..s, and also produced and co-wrote two songs (\"Stilll Lovin\' You\" and \"No U Turn\", etc... Darren Rahn mixed one song \"Just 4 U\" co-written with Preston Glass. So I\'m back for my second time around! Calling me a new-comer or undiscovered would be an egregious mistake. I\'m born in Tennessee, Berklee College Of Music educated, So Cal bred (at least for the past 20 years)… Tours with names you know (Atlantic Starr, Jennifer Holliday, Vesta Williams, Eric Benet, Rose Royce, Sheila E, and my wife, Evelyn “Champagne” King, Michel Polnareff (France), Michael Lington) and albums from equally famous folk (Walter Beasley, Warren Hill, Curtis Stigers, Najee, Michael Lington, Marion Meadows, Evelyn \"Champagne\" King, George Benson). None of this would mean a thing, though, if my new project weren’t such an outstanding sophomore effort. These days it takes something special to really perk up our ears here in SmoothJazzland. And I\'ve delivered just that! Fact is, I get it! I know what works for Smooth Jazz right now. This one’s a slam dunk, one fashionable track right after the other. So what’s left? You must hear it! * See it * Experience \" Freddie Fox\" the gentle southern man. Freddie FIRES IT UP with his signature soul on FEELIN’ IT…like a fresh funked fox playin’ in a forest fire of talent…smoldering, smokey and tasty…just the way we like it. The cat knows how to shred and smooth things out when foxes all over the world scream for more. With Smitty Smith, Evelyn “Champagne” King, Michael Lington and an entire den of smart like a fox first call cats Feelin’ It will have you GROOVIN. That’s just the way he rolls. I wanted to thank you for a copy of your CD. It\'s very well arranged and produced and I really enjoyed listening to it! I plan to add it to our playlists in the next few weeks. It was back in 2003, that Fox released his self-titled debut, a project, which gained favourable reviews including kudos from our humble show. Now, although perhaps a bit overdue but nonetheless worth the wait, Fox has just recently finished his follow-up project. 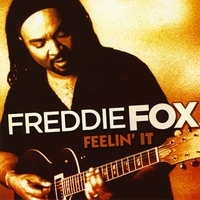 Helped by guests Nelson Rangell, Najee, and Michael Lington, Fox delivers as he claims \"one fashionable track right after the other.\" From that project entitled Feelin\' It, we\'ve selected one of the most fashionable in Still Lovin\' You!! Freddie is one of the best in his category . His second cd is even better than previous . I strongly recommended Feelin' It . Freddie's guitar show a level of a highest order and demonstrate how smooth jazz might sound like . It's been a long wait. Feelin'It has made me feel it. Sensational Sounds of Freddie Fox! Freddie! You are amazing! I love your latest release - Feelin it! I take it everywhere I go...the gym, my car the house the radio staion...outstanding! Rarely do you find a CD with more than 3 tracks on it that are worth while but FEELIN' IT - every track is sensational! Thank you for allowing me to share you with my listeners EVERY WEEK!!!!!! Love you to pieces Freddie! Caramel Kisses to you my friend! Love Pamela of KUNV 91.5 FM & Pamela's Place!!! !